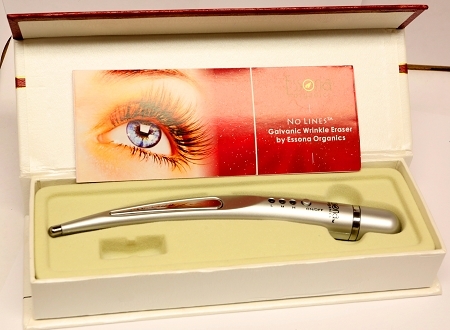 Home > Products > Face > NoLines Galvanic Wrinkle Eraser for Dazzling Eyes - Watch Wrinkles Disappear! with Gift Box, battery included. 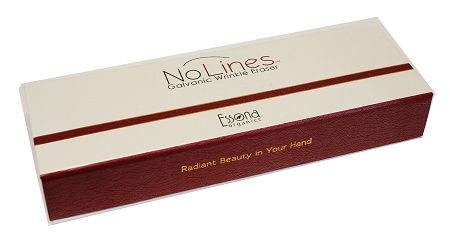 The No Lines™ Galvanic Wrinkle Eraser uses state-of-the-art technology originally developed in Silicon Valley. It uses galvanic micro current and ion activity to reverse the visible signs of aging by stimulating collagen in the skin, thereby gradually smoothing the skin and improving the appearance of fine lines, wrinkles, dark circles, eye puffiness and crow’s feet. The unique ergonomic shape of the No Lines™ Galvanic Wrinkle Eraser is specifically designed to target the delicate areas around the eyes to regain and sustain a more youthful, radiant appearance for life. There are 3 settings - low, medium, high. Expensive spa treatments are no longer necessary. This is the same technology used by expensive spas, but now you can get the same results in the comfort and privacy of your own home. Small and convenient to take with you anywhere. Your friends will notice the difference. Comes with Instruction Manual, Gift Box. You may also want to use NuFusion Organic Treatment Gel is formulated to enhance the efficacy of the overall treatment by increasing conductivity, providing nourishment and cushioning the skin. In addition, the gel introduces vital nutrients into the skin as the galvanic microcurrent works to increase the skin's absorption potential. You will see dramatic results with consistent home use. Will enhance and accelerate any professional spa treatments. Results are immediate and cumulative so it is recommended to be done 2-3 times per week. Gift Box - Battery Included. 1) Cleanse with Essona Organics Spring Dew or Seatopia Cleanser. Pat dry. 2) Spray Essona SeaMist Tonique on cotton ball and dab on face. 3) Apply Essona Organics NuFusion Treatment Serum around the eyes and other target areas. 6) Hold the unit comfortably as you would a pen with fingers on shiny sensor area. 7) Contact the tip to the wrinkles, indictor flashes and buzzer beeps. The machine is working properly. Move it slowly from the outer to inner face areas, around the eye area. Focus on one area (wrinkle) for 5-10 seconds. Treat four times for every individual wrinkle to achieve best results. 9) Apply Essona NoLines Organic Eye Serum gently with the fingertips. Complete instructions included. Watch the video for more information.